Though it loses some of the novel's satirical bite in its move to the big screen, "Crazy Rich Asians" — the movie — is sparkly, colorful and delicious in its own way. Rating: 3 stars out of 4. If I may draw a connection between “The Meg” and “Crazy Rich Asians,” two movies that both deserve to make plenty at the box office this month, it is this: Hollywood rom-coms, like enormous killer sharks, are theoretically extinct — once a staple of every studio’s lineup, they’ve now pretty much vanished. But every now and then, one of them roars to the surface, making a lot of us remember why we love this sweetest of genres. Sharks aside (now, would someone please make a rom-com involving giant killer sharks? Please? ), “Crazy Rich Asians” arrives on screens with plenty of baggage. Directed by Jon M. Chu, it’s not only the rare Hollywood studio film with an all-Asian cast, and the first centering on an Asian American’s story since “The Joy Luck Club,” it’s also an adaptation of a wildly popular novel (the first of a trilogy) by Kevin Kwan — one that presents fiendish difficulties in transforming to the screen. “Crazy Rich Asians” — the novel — has multiple main characters (the book alternates chapters between them), with intertwining plotlines over 500+ pages, and a deliciously satirical tone, particularly in its footnotes, as it skewers the excesses of the ultra-rich Singapore family at its center. Streamlining much of this, to make a coherent two-hour movie, was inevitable, and devout fans of the book might be disappointed by some of the changes. The tart tone has been replaced with a sweeter, more rom-com-friendly one, and my own favorite character, the glamorous Astrid (Gemma Chan), has been given so little screen time that you wonder why she’s even there at all. But that’s OK; the book will live on, and this sparkly, colorful movie is also delicious in its own way. 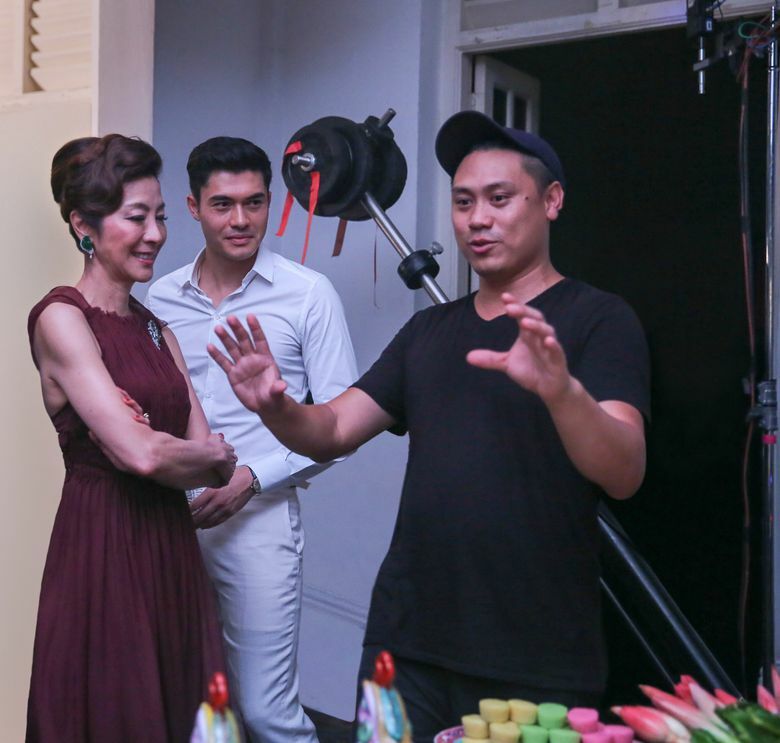 It focuses on the love story between American-born Rachel Chu (Constance Wu, an immensely likable rom-com heroine) and Singapore native Nick Young (handsome Henry Golding). Rachel, a New Yorker, has never been to Asia when Nick invites her there to meet his family, and she’s dazzled by the breathtaking scenery, the lovingly photographed and prepared food, the luxurious abundance of the real estate — and by Nick’s imperious mother, Eleanor (Michelle Yeoh), who quickly makes it clear that she disapproves of Rachel. If you have ever seen a rom-com, you will figure out where this is going, and “Crazy Rich Asians” happily goes there, full of all the best staples of the genre: a sassy best friend (the hilarious Awkwafina, stealing the movie with her delivery of “Daaaamn, Rachel”), an insanely over-the-top wedding scene (involving a water aisle, for heaven’s sake), and loads of moments in which someone has a crisis while wearing a fabulous outfit. Along the way, the movie has a few things to say about cultural identity, the bonds of family and the power of love. Is it as good as the book? No. Did it make me happy? Oh yes, and how nice to be reminded what a gift a joyful rom-com can be. 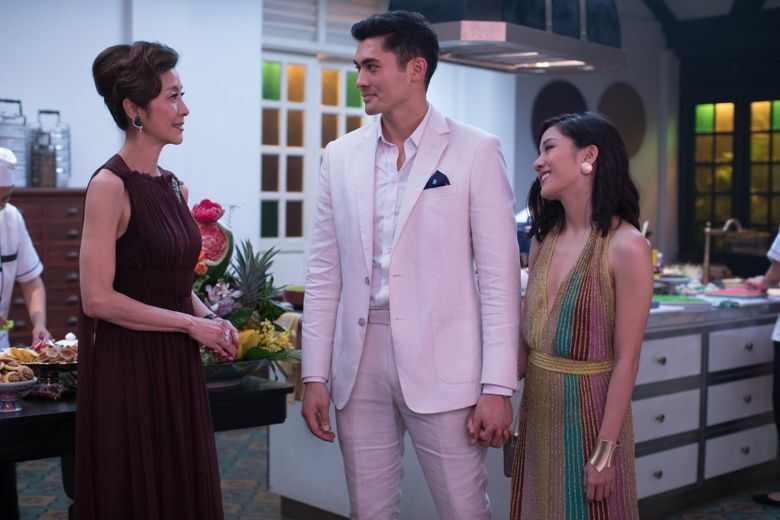 ★★★ “Crazy Rich Asians,” with Constance Wu, Henry Golding, Michelle Yeoh, Awkwafina, Gemma Chan, Ken Jeong, Chris Pang, Sonoya Mizuno. Directed by Jon M. Chu, from a screenplay by Peter Chiarelli and Adele Lim, based on the novel by Kevin Kwan. 123 minutes. Rated PG-13 for some suggestive content and language. Opens Aug. 15 in multiple theaters.